Tufa formations in Mono Lake. 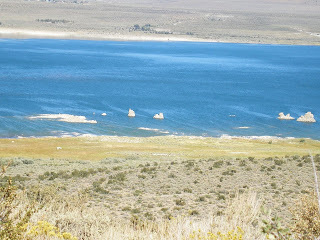 One of the unique features of Mono Lake is the tufa formations exposed when the lake levels decreased. The tufas are calcium carbonate deposits which formed in Mono Lake from alcium-bearing spring water flowing into the alkaline lake. These are quite an odd looking sight and are also noticeable wheny flying over Mono Lake. There are also other ways the tufas have formed in Mono Lake, but the tufa towers are, essentially, limestone deposits. In 1981, the California legislature established the Mono Lake Tufa State Natural Reserve, part of the California State Parks. The Mono Basin Scenic Area Visitor Center is located off Highway 395, at the north end of Lee Vining. The visitor center features a variety of exhibits about the natural and human history of the area. Lee Vining also offers the Mono Lake Committee Information Center and Bookstore, as well as the Mono Basin Historical Society Museum. 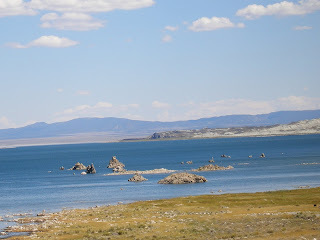 A great place to explore is the Mono Lake County Park, 5 miles north of Lee Vining. The park offers trails and a boardwalk so you can easily explore the flora and fauna of Mono Lake. Lee Vining is a good place to make your base in order to explore Mono Lake, the nearby ghost town of Bodie, and Yosemite National Park. Lee Vining is dubbed as the "Gateway to Yosemite" as it is near the Tioga Pass entrance to Yosemite. I will share more details about Lee Vining in a future post.